We have experience native language speaking staff to help you purchase vehicle from Japan auction sites and get it shipped to your country. We are JUMVEA certifies exporter base in Japan. We are 100% Genuine. *Shipping to Myanmar (Burma) is available under the condition CIF (Cost (of the vehicle) + Insurance + Freight) as well as C&F (Cost (of the Car) + Freight). This applies for both container and RORO shipping. There are no age limitations for vehicles going into Myanmar. The customer does need an import licence to import the vehicle. 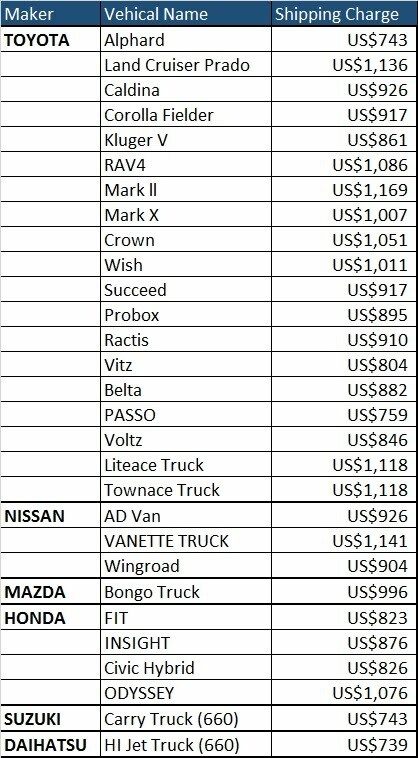 Here is the shipping rates for used cars and trucks to Myanmar. Here is the total cost breakdown example.